"I want this last chance to remind people that families and these military people are still sacrificing. People forget," said Trish, an administrative assistant at Marquette University. As his family looks back, the time slipped by surprisingly fast since Colin Glavan joined the Marine Corps, went off to boot camp and then to war. 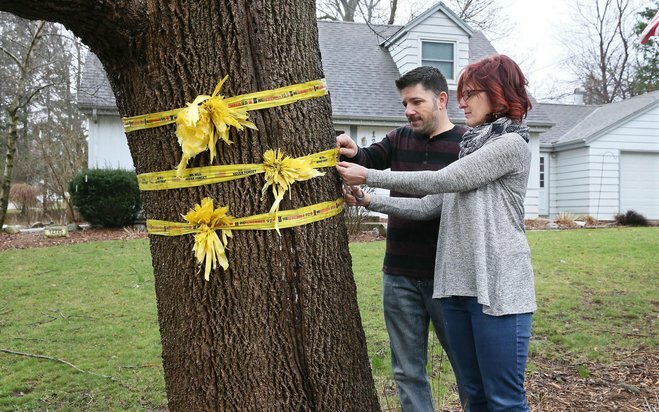 Last week, his parents, Trish and Curt Johnson, snipped three yellow ribbons from the large oak tree in front of their Brookfield home, one for each of Colin's deployments. And they removed the service flag and its blue star from their front window. Colin's last day as a Marine was Wednesday. Rain fell softly as the tattered ribbons released their grip, leaving behind ghostly rings. "I cried on the day he left," Trish said, "and I'm feeling kind of pitiful crying on the day he gets out." I followed this one family's journey in three previous columns, the first in 2006 when Colin, fresh out of Brookfield East High School, headed to boot camp in California. "I'll be honest," Trish said then as our country waged war in Iraq and Afghanistan. "I didn't want him to do it." The second was in 2008 as Colin, then 20, left for seven months in Iraq. "It's just one of those things I have to do," he said during a trip home to say his goodbyes. The mood was happier in 2011 when I wrote about Colin surprising his youngest sister, Kailee, at her middle school. He had just returned home from Afghanistan. For nearly a decade, the emotional ups and downs for this military family — for any military family — had Trish comparing life to a roller-coaster ride. The final terrifying twists and turns are behind them.